Hope you had a fantastic long weekend. How was Brooklyn? Jeff and I had a great time pool-hopping (Thank you Gardners and Englanders! ), and we hit up a pretty cool strawberry festival too. More on that to come. The one project I wanted to do this weekend was to plant some indoor herbs. I don't know how or why I got this idea in my head, but it seemed pretty cheap, and easy... right? Jeff was game, so I did a little research last week and we set out Saturday to make all our herbing dreams come true. 5 Yuppie points please. Here's what we came home with: Three, 6" terra-cotta pots with draining holes and saucers. Three packs of organic seeds: Peppermint, Oregano and Cilantro. I chose these after reading several articles online describing which herbs are easiest to grow indoors. More info here and here. Atticus is quite the helper and is obsessed with the smell of mint, which is apparently cousin to catnip. Silly me, I thought we could just plant the seeds in the pots, but another article online suggested we start the seeds in a smaller container like a yogurt cup or egg carton which we thankfully had. I cut off the top of the carton and poked 3-4 little holes in the bottom of each egg hole. More here. Then I sandwiched a piece of plastic (gallon zip lock) in between the egg carton and the top of the egg carton. This helps maintain good moisture levels. Or so I'm told. I'm trying to be organic as possible, but let's be honest, that can be a bit of a rabbit hole. I did a quick search online while I was at the hardware store trying to figure out which potting mix is best, AND organic. Since there isn't usually a lot of truth in labeling, I knew just because something says 'organic', it doesn't mean it's actually organic (fall down rabbit hole here). The brand I chose below is OMRI Listed, so I went with it. I added a little water to the soil so it was moist, but not dripping. Then added a couple scoops of the soil to each egg hole. The seeds were SO TINY! But I poked 3 little holes in the soil of each egg hole with a pencil and did my best to insert 3-4 seeds in each hole. No telling what actually made it in. Here's the final product for now. My germination station. You're supposed to cover it with another plastic bag until the seeds start to sprout to maintain humidity, but I was weary of adding even more plastic, so I have it covered with a glass casserole dish. 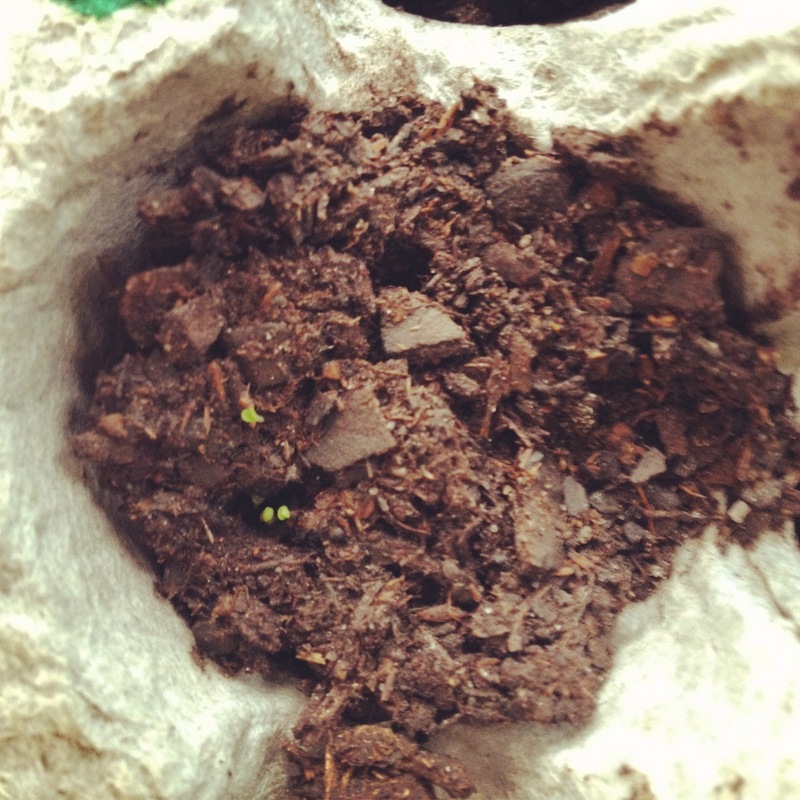 This was Saturday and so far... Look at those lil' sprouts!!! Fingers crossed!! !